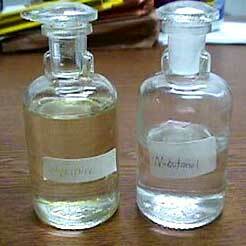 We are a prominent supplier of N-Butanol. Catering to varied industrial sector we are delivering premium quality N-Butanol. N-Butanol, supplied by us is usedÂ in the production ofÂ butyl acrylate,Â butyl acetate,Â dibutyl phthalate, dibutyl sebacate and other butyl esters. We ensure that our N-Butanol is safely packed to make it free from all the impurities. Weight % Component CAS Registry No.